What does this mean? In plain terms, motherhood and its tenets, its perfect-laden foundation is nothing more than contrived and man-made. The pressures that we feel as women when we become mothers are forced upon us by our society—our culture—and it seems that the onslaught of maternal perfection that we subscribe to is not as natural as we assume it is. Today’s cultural expectation of motherhood is worse than it has ever been. It’s an ideal that no woman—no human being—can achieve, and yet, we try to no avail. Thurer begins with a little history lesson that reveals—quite similar to Merlin Stones’ When God Was a Woman—that “God used to be a woman who worked outside the home.” From the Old Stone Age to A.D. 500, God was called “The Great Mother”; she was feminine, a deity, a mother, and all powerful. It was men’s fear in her and her ability to create life that began the suppression of the female. She and other female Goddesses were dethroned, and patriarchy was born. Since then, male-dominated cultures replaced her with a masculine God who has reduced the nature of woman to Adam’s rib—defying all the laws of biology. Women were no longer valued for their fertility. Men made it so they were only valued for their maternity—specifically, having men’s children. Since then, women’s roles have been ordained subordinate to men—and myths of how women used to be abound. Cave women, for example, were not the kind of women that we see depicted in films today, according to Thurer, being clubbed over the head by massive men and pulled by their hair into caves during the mating season. They were respected in their society, they contributed to their community, and they were free compared to the confines we face as women and mothers in today’s world. As a matter of fact, she points out, the only time women were confined to the home and the children was around the 1950s—right after WWII. Prior to that, most women worked, produced, and the care of the children was not the emotional and guilt-laden task that it is today. 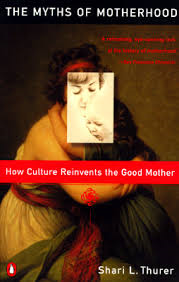 From antiquity to the twentieth century, Thurer paints a vast portrait of women as mothers and shows that originally, before patriarchy got its grubby hands on it and redefined it for all of us, “Motherhood was divine,” and women were not subordinate by nature; they were forced into submission. Today, motherhood has morphed into an institution—full of advice, science, psychology, and rules—telling women how to parent so that they won’t tarnish the impressionable nature of their children. And that to sacrifice their children’s needs in lieu of their own is the definition of a “bad mother.” A good mother gives and gives, her needs silenced and repressed for the best interest of her young ones. And like most institutions, motherhood has been put in place to control women and their place in society; it’s working. 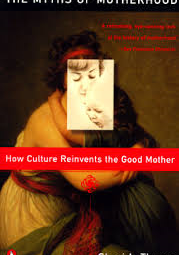 The institution of motherhood can be seen as a device used to condition women to a particular social role, which may or may not be in the best interests of their children or themselves, and from which parents may decondition themselves if they choose. As Thurer says, “our current ideal of the mother is…culture-bound, historically specific, and…tied to fashion” that keeps on changing. And interestingly, women seem to be so malleable that they change with the fashion—we subscribe to the new tenets of motherhood without blinking, changing our roles as we change our shoes. But we are not all fashion-conscious—not all shoe lovers. Because we don’t know the history of women—because most of us don’t know that women once reigned, that Gods were female—we believe the narrative that has been re-written, age old truths muted by our desire to please our husbands, our children, and our own silent needs to be better, perhaps, than our own mothers. We are so far removed from the power that women once held in the simple fact that they gave life that we allow ourselves to be redefined and molded into perfect caricatures of the maternal—designer moms that do it all: bake cookies and pies from scratch, kiss boo-boos, keep our men happy, maintain our looks and bodies well into our mid-forties, and hold on to our careers. Or we do it all and make motherhood our careers. This kind of pressure—this kind of definition—doesn’t apply to men, but for us it is constantly evolving, the rules for perfection becoming even more stringent and confining, worse than it had been for our maternal descendants. to calm the jangled nerves of [the]…mother…who is neither villain nor saint. I want to soothe the mind of a mother who mostly loves her children, who worships them at times and is repelled at others, who appreciates their beauty and intricacies, but is still tempted to lead her life outside and beyond them. I want to free this mother from the uncritical dependency on an ideology of good mothering that is ephemeral, of doubtful value, unsympathetic to caretakers, arbitrary, and…man-made. If this describes you as a woman and as a mother, then this is the book for you.